At a rally of some 12,000 people in Paris yesterday (1 May), the presidential front-runner confirmed his anti-National Front stance, denounced the illiberal regimes in Hungary, Poland and Russia and promised a new approach to CETA. EURACTIV France reports. 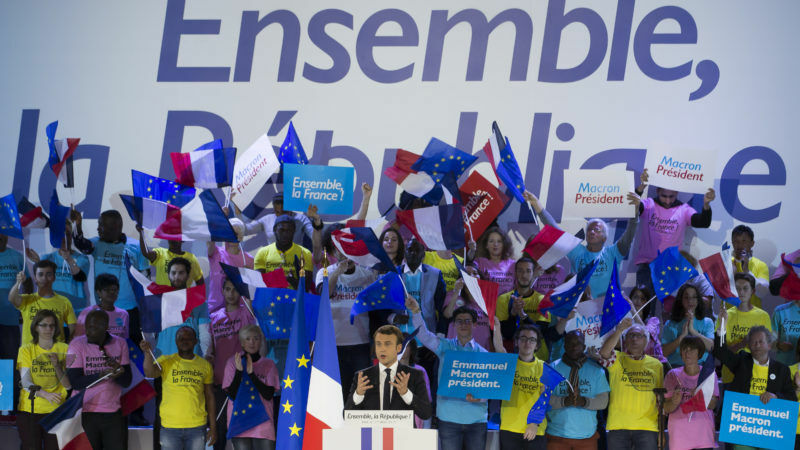 “What is at stake on 7 May is the future of France, the future of Europe.” Surrounded by European flags, Emmanuel Macron kicked off his Parisian campaign meeting on Monday (1 May) in no uncertain terms. “The National Front (FN) uses anger, spreads lies, foments division. But last Sunday, we finished ahead of them and that is already a victory,” Macron said. He insisted that En Marche was a movement of hope and optimism. He also mocked the FN over Le Pen’s latest U-turns. “They tell us we will have the franc in the morning and the euro in the evening,” the candidate joked. After announcing its alliance with sixth-place candidate Nicolas Dupont-Aignon on 29 April, the FN has softened its stance on leaving the euro; a proposal that had failed to convince French voters. Now the extreme-right party is advocating a staggered approach to leaving the euro, including a separate common currency to be used in parallel with the franc. “What they are proposing is that France should leave Europe, the world, and history,” Macron said. The favourite for next Sunday’s (7 May) second-round election run-off added that leaving the euro would be extremely harmful for workers, retirees and savers. In a foretaste of things to come, Macron also strongly denounced “Le Pen’s allies”. He condemned the values of Viktor Orbán’s regime in Hungary, Jaroslaw Kaczynski’s PiS party in Poland and Vladamir Putin’s Russia. Earlier in the day, Le Pen had accused the former economy minister of being a “clone of François Hollande”, while her father, FN founder Jean-Marie Le Pen, said Macron could not possibly have a vision for the future as he has no children of his own. “The FN propagates lies, particularly on the internet, where you can get away with saying anything,” Macron said. And he was not afraid to play the intellectual card, citing the philosopher Paul Ricoeur, whom he had previously assisted in his work. “My authority comes from the fact that I have read more books,” he said. In a gesture to those unconvinced by Europe, Macron also unveiled his plan to review CETA, the EU’s controversial free trade agreement with Canada due to enter into force soon. If he is elected, the candidate said he would establish a committee of experts, to spend three months examining the consequences of the agreement, particularly for the environment. He would then ask the European Parliament to modify the agreement based on the issues raised. He also promised to take action on the EU’s posted workers directive, which is currently under review, to avoid unfair competition and social dumping. “Let’s be proud to be French,” he said at the end of the rally, to cries of “President Macron” and “We are going to win”. But also – and more unusually – of “Europe, Europe”. Bonne chance, Emmanuel! Europe can do with a man like you.